Have you heard of Donna Wilson in London? Visit her website and see what you think. I like her rugs and teapot cosies, and best of all, you can shop her online and pay via Paypal. I love that because I find so many GREAT European designers that do not offer online shopping or who won't ship outside of their country or the EU and it totally frustrates me. The green birdie walk mat in 100% wool felt has to be the cutest thing I've ever seen, I love the imperfect shape of it and the little footprints trailing off to the side. 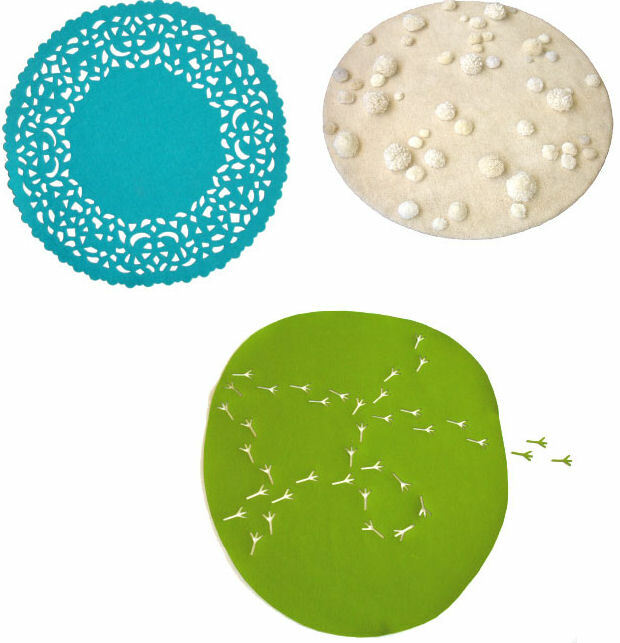 I think the pom pom rug would look great beneath an acrylic or glass coffee table. I would constantly trip over the pom poms otherwise. The doily rugs are my favorites though, the cut out shapes and bright colors transform something you grew up seeing on the table at grandma's house into a hip floor rug.